​Want to go into the t-shirt printing business? 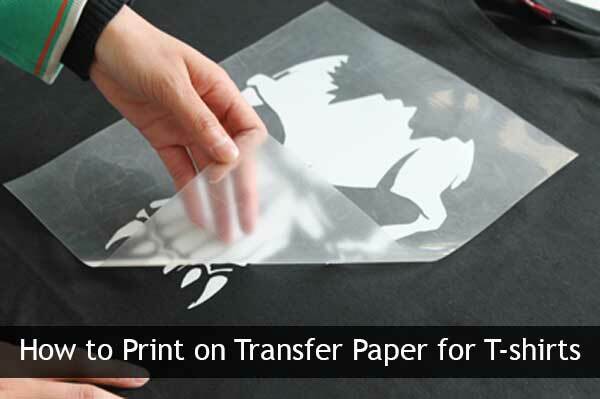 It is almost certain that you will frequently use transfer papers especially if you’ll be doing heat pressing. It is on these special papers that you will print your designs before transferring them to your t-shirts. Whether you’re doing it as a hobby or as a business, you’ll need to do the print on the transfer papers perfectly if you’re to achieve great results. This guide will take you through the steps of printing properly on the transfer paper, so your final results are awesome. There are different types of transfer papers, including inkjet transfer papers, sublimation transfer papers, heat transfer vinyl, laser transfer papers, and so on. The transfer paper you’re going to choose should match the printer you’ll be using. For instance, if you’re using an inkjet printer, then you should use an inkjet transfer paper and ink. The same case applies if you’re using laser or sublimation transfer paper. As for heat transfer vinyl, things are pretty straightforward because it comes colored and all you have to do is cut and print. Apart from that, you got to understand that some transfer papers are ideal for dark-colored fabric while others are meant for light-colored fabric. If you’re printing on dark fabric, you’ll need to use dark transfer paper, but if you’re printing on light fabric, then you’ll need light transfer paper. As we explained in another guide, heat press time, temperature, and pressure matter and these aspects have to be controlled a lot if you’re to achieve a great printing. All these have their pros and cons, but we’d advise you to go for the swing-away design if you’re looking for maximum flexibility. With a swing-away heat press, you can easily switch between attachments to print different materials, like t-shirts, plates, caps, tiles, and so forth. Small – these range from 5x5 inches to 12x15 inches. Standard/medium – these range from 15x15 inches all the way to 16x24 inches. Big – they range from 20x32-inch to 40x48-inch. As soon as you have your tools (heat press machine and transfer paper) and fabric ready, it’s about time you designed the artwork. This is where you get to have some fun and if you’re skilled in design, it should be an easy stage. All you need is a good computer and some design software like the Adobe Illustrator. On the PC, create the design as you’d like it to be on the transfer paper. Not to worry if you don’t have design skills – there are plenty of stock image sites on the internet from where you can download beautiful designs. Alternatively, you can get a freelancer to do it for you. Make sure everything is as you’d like it to be on the t-shirt, and if the fabric is light-colored, ensure you mirror the image before printing it on the transfer paper. There’s no need for mirroring if you’re printing on dark-colored fabric. The printing part is really easy – you just need to place the transfer paper in the printer and hit print. It’s not any different from printing on ordinary paper. Don’t forget – the coated side of the transfer paper is the side to print on. Once the paper is printed, cut out the excess as you won’t be needing that. You will need good cutting and weeding tools for that. After that, peel off the paper to expose the part that you want, which is the inside. They say that good designers test their work. If you’re doing it commercially, we’d definitely recommend that you test the design first. You have got to check whether the margins are correct and whether the color looks professional. That way, you will ensure there are no errors on the t-shirts, and you’ll make your customers happy. There’s something you should know – synthetic clothes don’t work very well with heat press machines. They often melt when subjected to high heat levels and pressure. The fabrics that work well with heat presses include polyester, spandex, cotton, nylon, and lycra. With that being said, it’s good to note that the heat press time, temperature and pressure play a huge role in determining the quality of the print, so be sure to use the right settings based on the fabric. Open your heat press machine and adjust the settings based on the fabric. The settings we’re referring to are temperature, time, and pressure. At this juncture, we hope you’ve already tested the design on an old fabric and satisfied that it will come out nicely on the t-shirts. Place your t-shirt on the printing mat, and place transfer paper on it, with the printed side contacting the part of the t-shirt where you want the design to go. Next, place the Teflon sheet that came with the transfer paper on top of the transfer paper to safeguard the t-shirt against excessive heat. Before pressing, be sure to place a thin cardboard paper between the front and back sides of the t-shirt to prevent the ink from getting transferred to the rear side. Once all that is done, go ahead and press. 1. Can I use just any printer to print on transfer paper? You shouldn’t use just any printer. Ensure the printer matches the transfer paper, so that if you’re using an inkjet transfer paper, you use an inkjet printer. If you’re using a sublimation transfer paper, then you use a sublimation transfer paper. 2. On which side of the transfer paper should I print? The coated side of the transfer paper is the one to print. 3. What does the term “heat transfer paper” mean? Heat transfer paper, or simply transfer paper, is a special thin paper that has a pigment and wax coat. You can print on this paper and then use a combination of pressure and heat to transfer the image to fabric, ceramics, and other surfaces. 4. What happens when I print on the wrong side of the transfer paper? The printable side is normally coated, and that’s how most people identify it. In the event that you print on the wrong side, you will have a poor transfer that will likely appear blotchy and washed out. The good news is that most transfer papers come with the specific information on how to print on them properly. Our advice is that you take it easy. If you’re just getting started, making mistakes will be natural but as you learn the ropes, things will get better, and you’ll be able to make flawless transfers.